*1 min walk from JR Teradacho Station. * Cycling Tour, Japanese Lesson tour hold. If we could not confirm your arrival by 2３:00 in the midnight, we consider the guest as NO SHOW CASE and we cancel the booking. Please note that we charge 100% of stay fee. ++Our reception business hour is 08:00 ~ 21:00 based on Japan Standard Time. We are afraid that we could not accommodate children under 18 years old without their parents or agreement. We are backpackers' hostel and all our facilities are shared basis. Would definitely stay here again! Cozy room and especially the mattress, had very nice sleep. location was great, bathroom and toilets always clean. The staff were very helpful and kind, with a comfortable common area. Free Breakfast is simple but good. Thanks! Grande regazzi!! We all loved this place and wished we could have been staying more than one night.I love the staff and I had the best time!! They were the best part about my stay. I’ll definitely stay again the next time I am in Osaka! Nice stay! - Helpful and friendy staff speak good English. - Comfortable bed, quiet room. - Free breakfast good for backpackers. - Hot shower, big enough. - Wifi works good. - Cozy common room with movie. - Nice location, only 2min by walk to get station. Highly recommend!!! Great Hostel with amazing staff. The hostel has great facilities like games manga(only japanese manga but still cool) tv with netflix and good acoustic guitars. Can cook your own meals and when they clean they do it really thoroughly. It's an alright hostel in Osaka. It has everything you need and the people who work there are wonderful. The hang out area is a bit small as well as the kitchen but it's fine. Strange mix between a backpackers hostel and a cheap hotel though. Saw a couple of families with young children as well as regular backpackers. Not quite sure who their target market is. 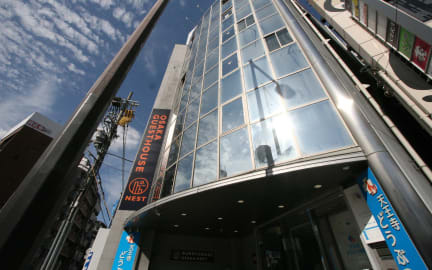 However, if you need a place to stay in Osaka and that's all, you're not going to go wrong here. I only stayed here for one night right after we arrived in Japan. It was kind of hard to find the hostel if it's already late and you're new to this situation. Good spot... I was there for 2 nights. Clean & definitely value for money.